Ealing Council has voted unanimously in favour of introducing a Public Spaces Protection Order (PSPO) in the vicinity of a Marie Stopes abortion clinic to prevent anti-choice activists from harassing and intimidating users and staff. Councillors agreed with the conclusion of a report by the council’s community safety team that these activities had a detrimental effect on the quality of lives of those in the locality. Humanists UK, which called for the introduction of the PSPO in a recent consultation held by the council, has welcomed this vote, but believes that national legislation is needed to fully address this problem. The PSPO, which will come into force on 23 April, is the first time such a measure is being used in relation to anti-choice activity in the UK. It will create a 150 metre ‘safe zone’ around the clinic in which it will be a criminal offense to carry out activities related to the termination of pregnancy. Within this zone, there will be a ‘designated area’ away from the clinic entrances in which members of recognised anti-choice groups can hold protests and vigils, but will not be permitted to approach women entering or leaving the clinic. The PSPO will be in force for the next three years, with a review of its effectiveness after six months. Humanists UK is a founding supporter of the Back Off campaign, coordinated by BPAS, which aims to change the law to provide specific legislation to make it easy to establish buffer zones around clinics. 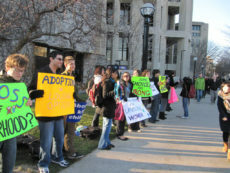 The campaign was established due to an intensification of anti-choice protests. Anti-choice activists have accosted women without solicitation, shouted abuse, exposed them to distressing and graphic images in leaflets and on large banners, filmed people entering and leaving clinics without their consent, and blocked the entrances. Humanists UK believes that the introduction of buffer zones balances the competing rights between women accessing safe and legal medical services without being harassed and intimidated for doing so, and those of the anti-choice activists to freely express their views. Such measures make it possible for women to access clinics without being subjected to unsolicited approaches from activists, whose primary intention is to cause distress, when they are undertaking an emotional and significant decision. The measure won’t ban or in any way prevent anti-choice activists from organising such activities, but offer women a meaningful choice about whether they wish to engage with these activities or not.